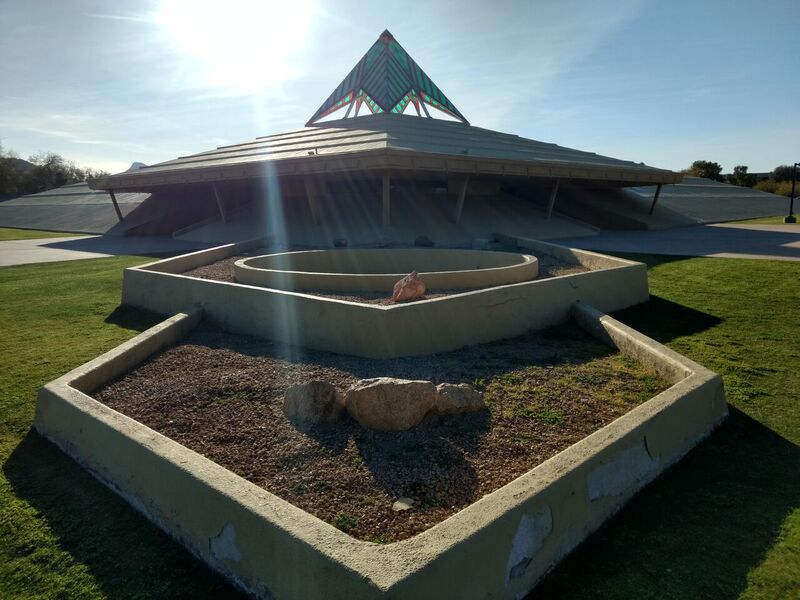 Capstone Cathedral (also known throughout the years as Capstone Auditorium, the Temple of Destiny, the Headstone, and the Great Pyramid) is located in north Phoenix near Tatum&Shea blvd and incidentally in the neighborhood where I grew up. The planters form a Plum Bob, extending straight out from the entrance. Frisby claimed he was commanded by God to build this 4000-seat cathedral in the desert on the outskirts of Phoenix. 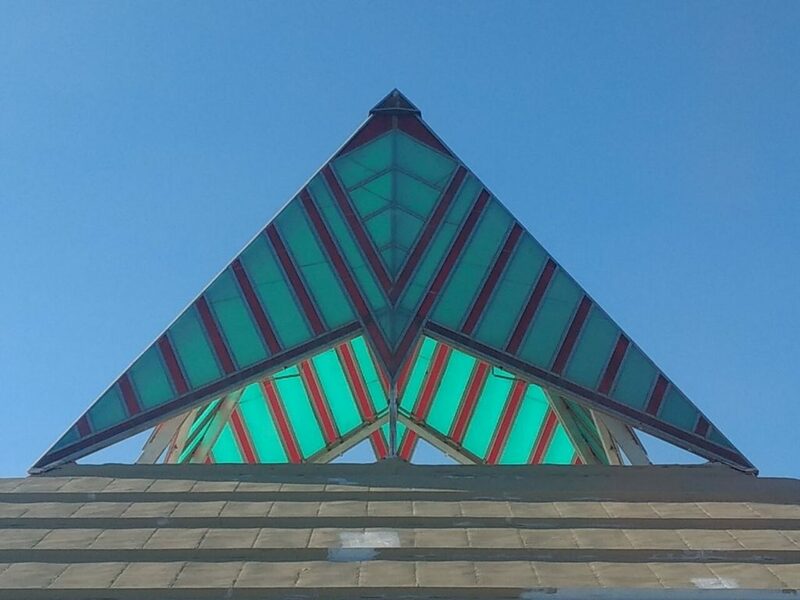 Once completed, this isolated pyramid was painted gold and fitted with a green capstone which lit up at night. Today, its dominion over the land has been somewhat subdued by the ever masticating Phoenix Sprawl. A Starbucks and Bank of America have been built on the property to the north along Shea Blvd. White paint has replaced the gold, and the green capstone no longer lights up at night, but still, this out of place pyramid beacons and commands attention nonetheless. This pyramid truly confounds me and is a standing testament to the definition of the word “contradiction.” For starters, hands down and without a doubt, this structure contains Masonic symbolism and esoteric wisdom at every turn, this is not in question. So much so that Frisby’s Capstone Cathedral has earned its own page here at The Phoenix Enigma. On the other hand, its builder preached regularly against the occult his entire life. Back to the other hand, he asked his followers to look to the Masonic Pyramid on the back of the U.S. One dollar bill to help understand how to decode his own Capstone Cathedral. And back to the other hand yet again, he wrote hundreds of scrolls revealing the revelations given to him by God to share with the world. The Capstone. One can see the Masonic Compass and Square embedded into the design. Without a doubt, Neal Frisby was a man of God who believed that Jesus Christ was the one and true savior of mankind. 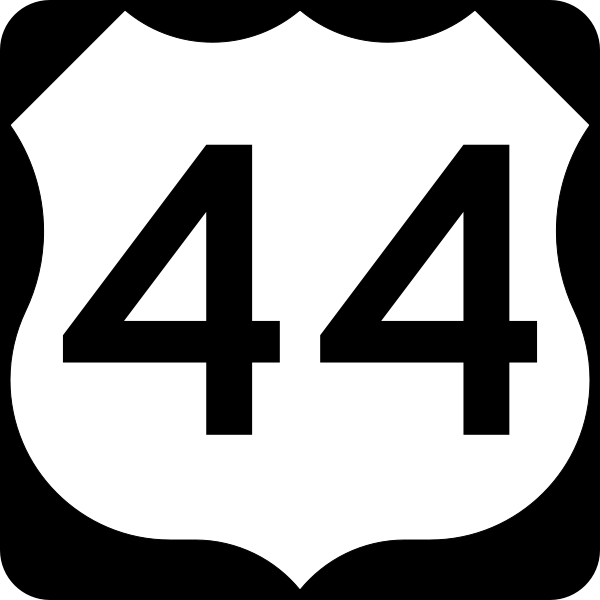 However, constructed into his pyramid at every turn is Masonic numerology, and meaning which he preached vehemently against his whole life. For a deep look into Neal Frisby and his Capstone Cathedral please see my article here. 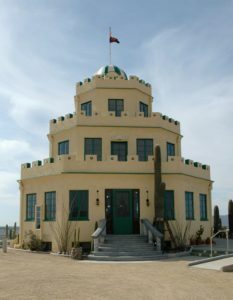 Our next pyramid is located at Tovrea Castle or “The Wedding Cake Castle.” This interesting structure is a historic Phoenix landmark and one of the official Phoenix Points of Pride. Originally intended to serve as the centerpiece for a high-end resort by its architect and builder Alessio Carraro, Carraro’s dream never came to fruition as E.A. Tovrea purchase land next to his castle and began farming pigs and cattle. Carraro knew he could never have successful resort next to animal farming so he unknowingly sold the property to E.A.’s wife Della through a real estate agent. The building shortly thereafter became the private home of E.A and Della Tovrea. Whereas one can make the argument that the castle itself is a stylized step pyramid, and I’d be apt to believe that, the real pyramid sits in the garden to the north of the house. 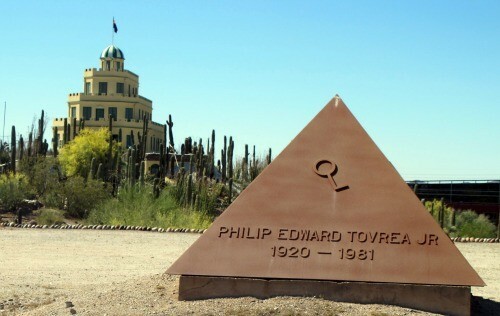 This pyramid is actually a “Capstone” and was intended to be the final resting place for E.A. And his wife Della, and other immediate family. However, this time it was Tovrea’s plans which never came to pass. Before Tovrea died, changes were made to the local internment laws and the capstone was turned into a family monument. Carraro ended up purchasing a boulder field just outside of Yarnell Arizona and spent the rest of his days painting boulders and living in eccentric artists lifestyle in the high Arizona desert. Fittingly the Tovrea family has been cursed with unfortunate accidents and murder for the transgression of their patriarch E.A. Tovrea. Do I think Tovrea was a Mason? It definitely appears so with his choice for a tomb. However, I cannot find any evidence to prove this. That being said tracking down Masonic affiliation is not as easy as one might think. There are no public records to access and unless the Mason himself comes out in a public declaration is very likely that his affiliation will go missed. 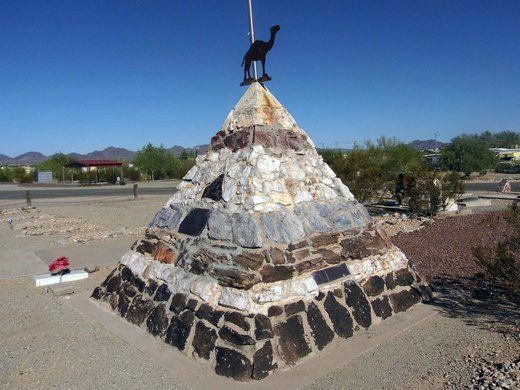 The Hi Jolly monument sits in the Quartzsite Cemetery and marks the final resting place of Jakji Ali, Later known as Philip Tedro, but most commonly known as “Hi Jolly.” Born c. 1828 – Dec 16th, 1902, Hi Jolly was an Ottoman subject. He was one of the first camel drivers ever hired by the U.S. Army to lead the famous camel driver experiment which fell under the United States Camel Corps. This experiment eventually failed as the animals were ill-suited to travel through the American Southwest region. Like many of the famous men of his day, Hi jolly became a living legend in his time. Once, after having been insulted for not having been invited to a German picnic in L.A. He crashed the event by driving a camel-drawn cart into the center of it, pulled by two of his pet camels. But what of the pyramid? Well, it does fall in line with the other pyramid monuments built for famous people during this time period, IE. Hunt, Tovrea, and Poston. But it’s hard to imagine that Hi Jolly was a Freemason. He very well may have been, but there is simply no evidence for this. It was Governor Benjamin Moeur who dedicated the monument to Hi Jolly in 1935. It is built with local stones and topped with a copper camel. As it stands today the monument is the most visited location in Quartzsite.